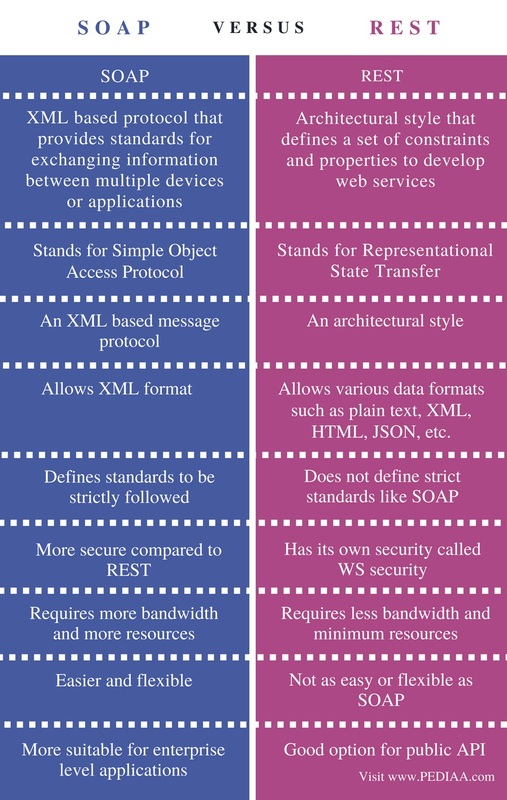 The main difference between SOAP and REST Web Services is that the SOAP (Simple Object Access Protocol) is an XML based protocol while the REST (Representational State Transfer) is an architectural style. A web service is a collection of standards or protocols for exchanging information between multiple devices or applications. Different applications use various technologies and programming languages. A web service provides the common platform for these applications to communicate with each other. For example, a Java application can communicate with PHP or .NET application using web services via the network. A web service simply provides a language independent platform to ensure communication among various technologies. SOAP and REST are two types of web services. SOAP stands for Simple Object Access Protocol. It is an XML based protocol. It allows the applications built on various programming languages and different operating systems to communicate with each other. SOAP provides several advantages. It is platform and language independent. Therefore, the SOAP web services can be written in any programming language and executed on any platform. It works well in Enterprise Environments. It has pre-built extensibilities according to the WS standards. Furthermore, it provides built-in error handling and automation or certain language products. While developing a SOAP-based application, it is important to follow the standards. Usually, they are slow; require more resources and more bandwidth. Overall, it is more suitable for enterprise-level applications in which the security is a major concern. REST stands for Representational State Transfer. It is not a protocol. It is an architectural pattern. A web service that confirms the Rest architectural style is a RESTful web service. REST is easier and flexible. These services do not follow strict specifications like SOAP. It requires minimum bandwidth and resources. Moreover, it is language and platform independent. REST is a good option for a public API. Nearly, 70% of public APIs are based on REST. Usually, it is preferable than SOAP. In brief, it helps to build lightweight, scalable and maintainable web services. REST web services can use SOAP web services for the implementation. SOAP is an XML based protocol that provides standards for exchanging information between multiple devices or applications. REST is an architectural style that defines a set of constraints and properties to develop web services. SOAP stands for Simple Object Access Protocol. REST stands for Representational State Transfer. SOAP is an XML based message protocol while REST is an architectural style. SOAP allows XML format. REST allows various data formats such as plain text, XML, HTML, JSON, etc. SOAP defines standards to be strictly followed. In contrary, REST does not define strict standards like SOAP. SOAP is more secure compared to REST. SOAP has its own security called WS security. SOAP requires more bandwidth and more resources. REST requires less bandwidth and minimum resources. REST is easier and flexible than SOAP. SOAP is more suitable for enterprise level applications while REST is a good option for public API. The difference between Soap and Rest Web Services is that Soap is an XML based protocol while Rest is an architectural style. The programmer can select Soap or Rest depending on the programming language, the environment and the requirements of the application. Whether the programmer selects Soap or Rest for web service, it is important to test the API thoroughly. Lithmee holds a Bachelor of Science degree in Computer Systems Engineering and is reading for her Master’s degree in Computer Science. She is passionate about sharing her knowldge in the areas of programming, data science, and computer systems.